John is a professional joiner/carpenter. He uses learned skills from a professional trade school in England as a young man…so when he makes furniture he does not use nails…he mainly uses joinery–the joining together of a piece of wood within another piece of the wood- a joint. Screws are also used in his furniture making, but mainly not in the table joints. The mortise and tenon joint is one of the strongest ways to hold the wood together So our tables do not come apart for shipping. The top of the table itself does come off but is then reattached with a type of button biscuit toggle type joint, seemingly specific to his English training. He uses mortise and tenon joints for the rest of the table. However, I did find a similar description in a USA webpage with great pix of 17 ways to fasten a table. Apparently, not all tables are nailed or screwed together. Now the wood top of our cast iron sewing machine base tables ARE screwed together. A top of the sewing machine base tables can be removed and screwed back but if the table has a cabinet on the top. the cabinet cannot be removed. So for all of these reasons, our shipping cost may be higher than average- we cannot tear the table down to flat pack it…but we are not a flatpack store. We usually ship via freight and have to make a crate and pallet for the sewing machine tables. we would probably have to do that for the dining tables also and the farmhouse table with the bench, John did use some screws but it still would have to be shipped whole. We make one of a kind items we are proud to make- As did the craftsmen of the Victorian age- we use quality woods and traditional joinery techniques to make a quality product for our customers. a. The art or craft of a joiner; cabinetmaking. b. Work done by a joiner; fine woodwork. 2. 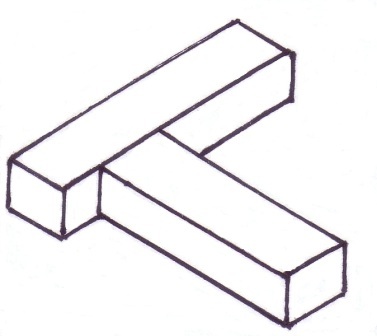 The methods or techniques used to connect pieces of wood together. The mortise and tenon joint is another one of the strongest and most appealing woodwork joints able to be made because of its flush fitting design. Like the dovetail joint this woodwork joint can be difficult to properly construct but it is incredibly strong and aesthetically pleasing if constructed well. 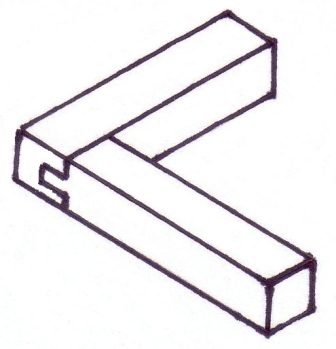 This woodwork joint consist of a tongue that is secured into a slot and it is used in areas such as table legs. For structural areas like these the joint must be tight fitting to ensure maximum strength but also to achieve a neat flush look. There are slightly different versions of this woodwork joint which include double tenons, twin tenons and haunched mortises and tenons. The haunched version of this joint consist of an extra piece of wood that is half the depth of the mortise and it is mostly used at the end of the timber to prevent twisting. The double and twin tenons are exactly as they sound being two tenons next to each other which create an even stronger joint. 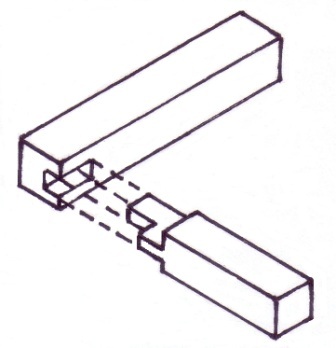 The double tenon is made of two separate tenons while the twin tenon is two tenons which are joined in the middle. Areas where the mortise and tenon joint or some form of it are most effective and best suited are areas which are required to support a large amount of weight or are structurally important such as the rails and legs of a table or chair. The tenons should be made to the correct length and thickness depending on how much weight will need to be supported. 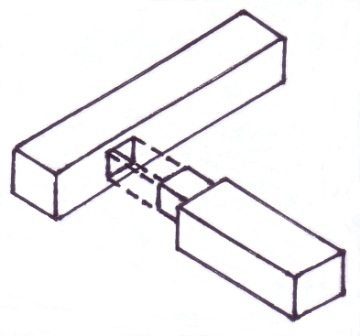 For example if the joint is for a large dining table you will need a larger and thicker tenon or even a double or twin tenons to support the extra loads and weights the table will likely endure but also ensure the mortises are tight fitting to create the strongest and most aesthetically pleasing joint possible. Copyright © 2010 – 2016 woodworkbasics.com. All Rights Reserved.